WASHINGTON — Lawyers for two women who accuse Supreme Court nominee Brett Kavanaugh of sexual misconduct say they fear the FBI is not conducting a thorough investigation, as Republican leaders steer toward a decisive vote on the nomination this week. Also Tuesday, an attorney for another accuser, Deborah Ramirez, said he’s seen no indication that the FBI has reached out to any of the 20 people who Ramirez told them may be able to corroborate her account that Kavanaugh exposed himself to her when they were Yale freshmen. The attorney, John Clune, said Ramirez was interviewed by the FBI on Sunday and provided agents with the witnesses’ contact numbers. One Republican official said he’d been told it was possible the FBI investigation could be completed as soon as Tuesday night or Wednesday morning, but it remained unclear. The official revealed the private conversations only on condition of anonymity. Details were scant about precisely who the FBI was interviewing, but agents are known to have interviewed at least four people. Senate Majority Leader Mitch McConnell told reporters that “I can tell you with certainty” that the FBI report will be finished and the Senate will vote this week, though he didn’t specify when. Underscoring the GOP effort to vote on Kavanaugh quickly — and stuff a cork on the chances for fresh allegations to emerge — he said “it shouldn’t take long” for lawmakers to read that report. “That will not be used as another reason for delay, I can tell you that,” he said. Because of procedural steps, a final confirmation vote was unlikely until late in the week, perhaps over the weekend. McConnell has denounced Democrats, who have questioned Kavanaugh’s truthfulness and temperament, for hurling “mud and muck” at the judge. The senator said he is requesting the recordings because the committee has obtained a letter that “raises specific concerns” about the reliability of Ford’s polygraph test. In the statement, a man who says he is Ford’s former boyfriend says he saw Ford, a psychology professor, coach a friend on how to be less nervous during a polygraph examination. A remark by President Donald Trump, who nominated Kavanaugh, spotlighted the gulf between #MeToo-era voters who’ve rallied against sexual abuse and conservatives who say the nominee is entitled to a presumption of innocence against uncorroborated allegations. “It’s a very scary time for young men in America when you can be guilty of something that you may not be guilty of,” Trump said at the White House. When Trump ordered the FBI investigation last week under pressure from a handful of Senate Republicans, he set a deadline of this Friday for the probe’s completion. They include Mark Judge, who Ford has said was in the bedroom where, she says, a drunken Kavanaugh sexually attacked her at a 1982 high school gathering. Also interviewed were two other people Ford said were present but in a different room: Patrick “P.J.” Smyth and Leland Keyser. Judge, Smyth and Keyser say they don’t recall the incident described by Ford. McConnell singled out Swetnick’s accusations, for which he said “there conveniently happened to be zero witnesses.” She is represented by Michael Avenatti, whom McConnell called a “tabloid lawyer.” Avenatti also represents adult-film actress Stormy Daniels in her claim that Trump paid her for silence about an alleged 2006 affair. “We can’t have this on the court. We simply can’t,” Flake said at an event sponsored by The Atlantic magazine. Sen. Joe Manchin, D-W.Va., facing a competitive re-election this fall, said he’s awaiting the FBI report. 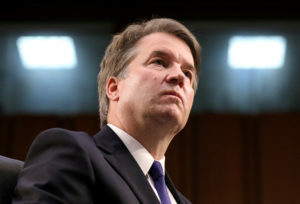 Kavanaugh was questioned after the 1985 altercation but wasn’t arrested. The report says 21-year-old Dom Cozzolino told police that Kavanaugh threw ice at him for “some unknown reason.” Cozzolino said he then got hit on the ear with a glass. The White House noted that Kavanaugh wasn’t arrested or charged, and mocked the incident as irrelevant.